O Kelowna, I will miss you and feel like I can never repay you for all you have been for me. 5 years ago I stood at the front of the room as a yoga teacher. I had a shaky voice and so much self doubt, but you kept coming back to class, so I kept learning and teaching. You were there since the start; you've trusted me with your minds, bodies, and hearts. We've had fun, you stood by me through the worst time of my life, and now it is time for me to say good bye.But before I go, I want one last time with you! 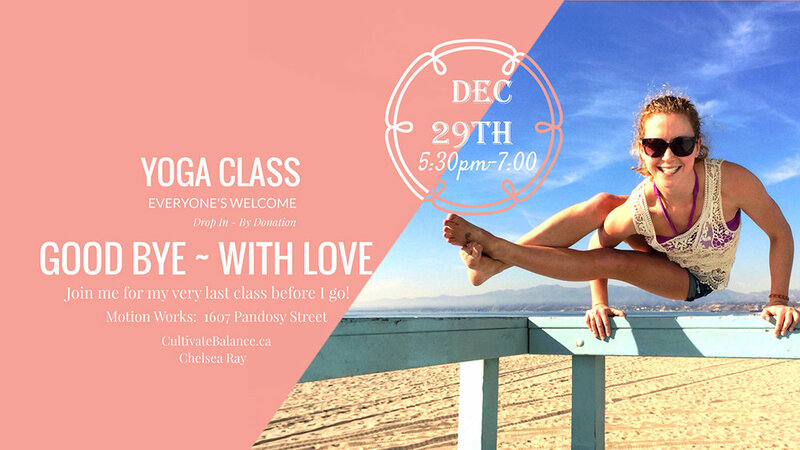 Please join me for an all levels, everyone is welcome, yoga class. Expect: a fun playlist, great practice, hopefully some insightful teachings, and surely a lot of love. Bring your mat, some water, and come play! Motion Works: 1607 Pandosy Street December 29th 5:30pm-7:00 (doors open at 5:15) Drop in, by donation.